Leather bracelet is sturdy and durable. 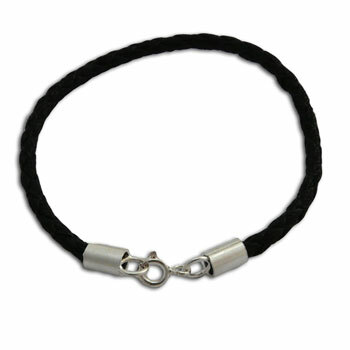 It fastens with a sterling silver hook and is suitable for men and women. Leather necklaces in three different lengths for men or women: 18", 20" and 22". Fastens with a sterling silver clasp. Can combine with most of our pendants. Sterling silver lotus pose pendant (padmasana pendant) is beautiful and fun. Sterling silver om pendant in a classic style to be worn every day.